When one looks across the technology and engineering landscape, there’s certainly much to see in the way of ethnic diversity. That can’t be said for gender diversity, however. While progress has been made with the growth of women in engineering or tech-focused careers, men continue to dominate the tech world. That’s what makes Michelle King, a radio industry veteran in her own right, an extraordinary example of perseverance, overcoming life challenges, and balancing personal needs with professional gain. Today, King handles radio industry sales for media software provider WideOrbit. Her journey was far from easy. But, it very much involves small-market radio, and a strong mentor. Like many longtime radio industry standouts, King found a love for the business at an early age. At age 16, she contacted a local radio station in her hometown of Lewiston, Idaho, inquiring about an internship. This was Top 40 “K107.” King placed a call to the station’s Music Director. He acquiesced, and gave her what is today her first radio industry job. “I did telephone research to start, and was the ‘dove runner,'” she says. This saw King serve as a courier for two-track reel-to-reel tapes, distributed among all of the Lewiston station so local spots could be run in an efficient manner. It was everything a high school junior could have asked for in December 1990. Yet, come March 1991, she would need to take a break from her internship. At the local high school, there was a lot of whispering, and judgment. “A teacher would kick me out of class every day because I was pregnant,” King recalls. The her in King’s life was future daughter, and both were embraced by KMOK’s owner Rob Prasil, affectionately called “Papa Rob” to this day. KMOK “just became part of our life,” she says. Meanwhile, King’s home life as a pregnant teenager involved a single mom who suddenly found herself compelled to do more with her career. With becoming a grandmother a reality, King’s mom quit her job as a secretary and enrolled in college classes. In 1991, with King as a high school senior and a baby girl in daycare, her 45-year-old mother entered nursing school. For King, classes at Lewis and Clark State College followed high school. There, she received a theater scholarship and earned a communications decree. But, King was not aiming to be competing with Idina Menzel for a role in Rent. King was mostly doing tech in the theater. It proved to be the right path. Now in a paid capacity at KMOK, which moved to Country (like many Top 40 stations) in the mid-1990s, King became the go-to person when it came to computers, which were becoming an essential part of the radio business. KMOK’s owner, Rob Prasil, was managing all of the DOS-based PCs. “I started following him around and asked him lots of questions,” King says. One day, some 26 years ago, Microsoft ACCESS arrived in a box. Introducing a database management system to the spreadsheet format, it proved to be a revolutionary tool for businesses across the world. Prasil handed the box to King and was asked to master it, and to create a relational database for the Ida-Vend stations. 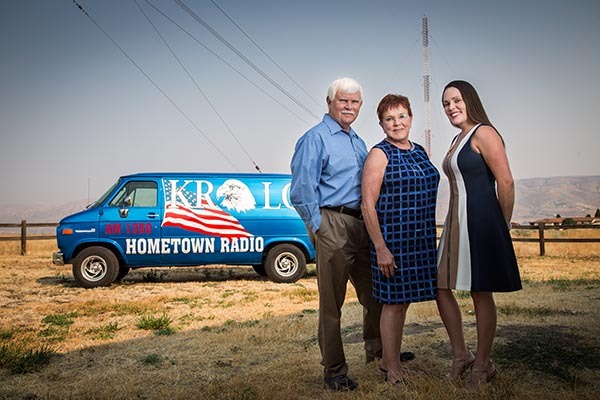 Not only was King doing IT tasks for Prasil, she was also helping with the business’ accounting, as the radio station also owned a graphics company. And, for a short time, King moonlighted at a local TV station doing CG work, including creating weather maps. Upon her graduation from college, the big city tugged at King. Prasil put in a call to University of Idaho alumnus Lucy Rice, Director of Sales for Entercom Communications’ Seattle stations from 1996-1998 and today the Portland, Ore.-based owner of media sales and management consultancy Sales Sense. King was offered a role as a sales assistant for Entercom/Seattle. She took it. How did it go? After two years, the lure of Lewiston grew, primarily due to family needs. King contacted Prasil to inform him of her intention to return home. By then, Ida-Vend now had three stations and needed an IT manager. With six more stations on the way, a wide area network needed to be built to smoothly move files back and forth. King joined the team that accomplished the build-out. On Sept. 1, 1999, King went home. Sixteen years later, a career shift came. It was largely thanks to a long-standing client relationship with a vendor that is today WideOrbit. “As we were growing and buying stations, the automation system owned by Google — and now owned by WideOrbit — was being used,” King says. In fact, Ida-Vend stations became the beta test site for the precursor to WideOrbit, known as Google Radio Automation. “We were testing the ability to transfer audio between locations and distant-city voice tracking,” King says. This was in 2006. WideOrbit purchased Google Radio Automation in August 2009, and King was in an enviable position at her company. Then, the Operations Manager departed. “Because I helped to implement all of the infrastructure and installed the traffic solution, each time we had a staff transition I would be the one to lead it because I knew it,” King explains. When the OM left, King was tasked with managing 100 computers — and a staff of 85 humans. “It became very obvious that I needed some management training, because managing people is a whole different world than managing computers,” she says. Enter the NABEF Broadcast Leadership Training program. King was accepted to the program, and received a fellowship. This also united Michelle with “great mentor” Jeanette Tully, who died on Sept. 11 in Nashville. King says her passing was “heartbreaking.” Yet, she is grateful for her wisdom, and her teachings. King completed her BLT education in 2011. Fast-forward to summer 2015. Selling automation turned out to be a need WideOrbit had. In August 2015, following a “retirement” from Ida Vend, took on a role as an automation sales person. Today, King — now a grandmother — is managing sales of WideOrbit’s software products for radio. What does this say to other women — regardless of their personal circumstances — about going into the IT, and technical, side of the radio business? Most of the time, it is not the men that are the problem. Why does Michelle believe the gender role issue is bigger among other women? In August, King celebrated three years at WideOrbit, working from Lewiston. While personal determination played a factor, strong mentorship was also a key aid. It is an aid that can lead other women into the world of IT. For girls that want to get into technology, find mentors, and Michelle is happy to serve in that role. Great article on Michelle King. I met Michelle in September at our radio station in Bradenton/Sarasota, FL to explore WideOrbit Traffic software. She came to the Florida NAB Radio Show a day early to meet with the IT/Engineering staff at the station to explore options for our 37 stations. In meeting with her and our staff, she shared everything that is in the article. We are still in negotiations/consideration with Michelle. She does know all the bases of broadcast operations and took a tour of our IT and Engineering bays while with us. We are so pleased to have Michelle on our team at WideOrbit and to see her profiled in this article. Her expertise has been invaluable in helping our customers succeed and WideOrbit’s business to succeed. I hope her story will be an inspiration to others to chase their dreams.